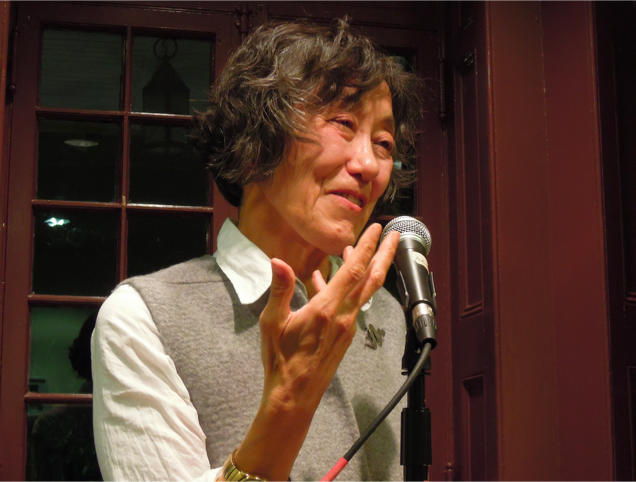 Poet Mei-Mei Berssenbrugge, born 1947 in Beijing, is known for her poems' long, deceptively prose-like line, which she uses to navigate through many interconnected topics, including the natural world and the inner realm of human thought and perception. Berssenbrugge is the author of The Heat Bird (1983), winner of the American Book Award; Empathy (1989), winner of the PEN West Award; Sphericity (1993); Endocrinology (1997), a collaboration with the artist Kiki Smith; Four Year Old Girl (1998), winner of the Western States Book Award; Nest (2003); I Love Artists: New and Selected Poems (2006); and Hello, the Roses (2013). She received a BA from Reed College and an MFA from Columbia University. Berssenbrugge has received two fellowships from the National Endowment for the Arts and honors from the Western States Art Foundation and the Asian American Writers Workshop, and has taught at both the Institute of American Indian Arts in Santa Fe, NM and in New York City. She resides in New Mexico. Seating is strictly limited for these programs, and an RSVP is required to attend. Please note the following program dates and times, and you can RSVP for any (or all!) of the programs in the 2019 Kelly Writers House Fellows series by writing to whfellow@writing.upenn.edu indicating the programs you want to attend.